Australia is a land where strange things just seem to happen. First, it rains fish in the desert, and now parrots are just falling from the sky. I can’t explain the raining fish, but as for the lorikeets that are just randomly falling out of trees and dropping to the ground in mid-flight? Apparently, those birds are just drunk. Somehow, lories and lorikeets in Australia’s Northern Territory are getting drunk off something in the environment, to the point where they’re unable to fly. Says Lisa Hansen, of Ark Animal Hospital in Palmerston, near Darwin, Australia, “It happens every year around this season, they lose all balance and we do find them fallen out of trees and the sky. It seems that the birds get intoxicated by something they have eaten and it renders them unable to fly and function correctly,” adding that the birds can get very sick or injured as a result. Animals and alcohol just don’t mix, gang. That parrot’s testimony might be needed in court; if you see any kind of colorful bird, don’t serve it alcohol! 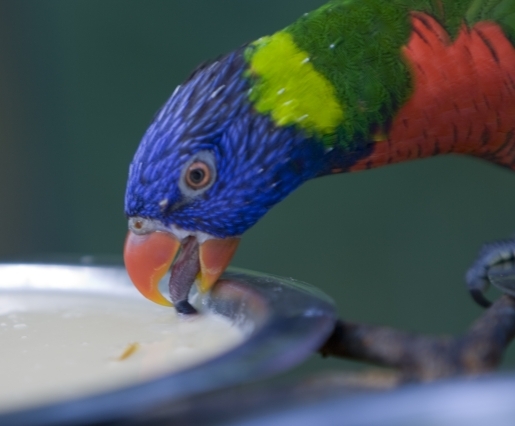 Let’s nip this lorikeet drinking problem in the bud!